Preheat your oven to 375 F degrees. Line a baking sheet with parchment paper; set aside. On a clean work surface, sprinkle some flour. This will keep the puff pastry from sticking to your work surface. Place one of the puff pastry sheets on the work surface. Brush it with some of the egg yolk. Add the 2nd sheet on top of the first one and brush with egg yolk. Repeat with remaining sheets. DO NOT brush egg yolk over the top sheet. Roll out the sheets so that you have a square of about 12 inches by 12 inches. Using two round cookie cutters, one that's 2 or 3 inches in diameter, depending on how big you want them, and 1 that's 1 inch in diameter, cut out donut shapes from the dough. You should get about 16 donuts. 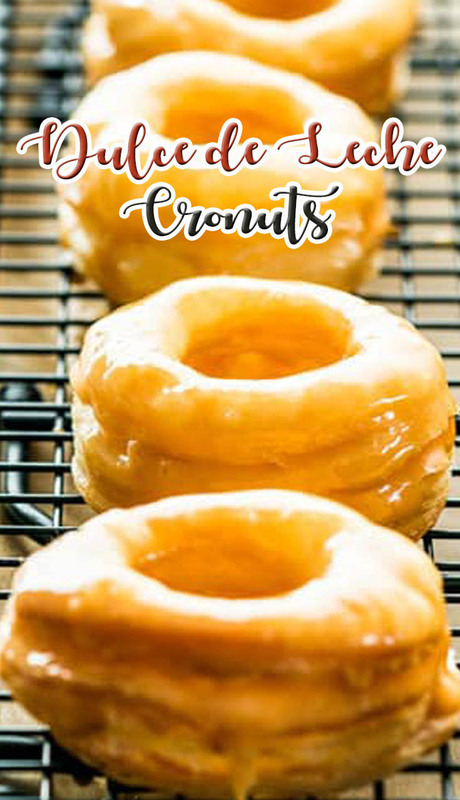 Place the donuts onto the prepared baking sheet and bake for about 20 minutes or until golden brown. While the donuts are baking, make the glaze. Add all the ingredients for the glaze into a medium size bowl and whisk well, until smooth. Place a cooling rack over another baking sheet that's also lined with parchment paper. Remove cronuts from the oven and dip into the glaze, then place onto a cooling rack, letting the glaze drip down. Optionally you could drizzle them with more dulce de leche and then sprinkle with a bit of powdered sugar before serving them.